The final book on this year's Booker Prize shortlist - and the final of my trip through the longlist, since I'm skipping the remaining two - is Damon Galgut's In a Strange Room. Galgut was an author of whom I was entirely unaware until this longlist, but I had read some glowing reviews of this book, so even though I wasn't able to get my hands on a copy until after The Finkler Question was announced as winner, I was still quite keen to read In a Strange Room. In a Strange Room is a slim book - 180 pages in smallish hardcover, but another way of viewing it is as three linked novellas published together (indeed, I believe the three sections have been published separately in magazines). Each section is essentially self-contained - there's no references from one to the next. 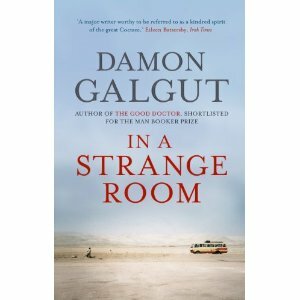 And since Damon Galgut is a South African writer (the only one on this year's longlist, if memory serves) writing in the first person about a South African writer named Damon, there might be a tendency to wonder how autobiographical In a Strange Room is. I've no idea, so won't speculate and don't much care. The three sections deal with three different journeys Damon went on, as he writes about them years later. It's not entirely accurate to say that this book is written in the first person - most of the time, older Damon writes about younger Damon in the third person, only occasionally switching to the first-person pronoun. This provides a measure of detachment, of distance, in his descriptions of his younger self. And it works quite well, at least so far as I was concerned, not least because of the extra weight it gives the passages where middle-aged Damon refers to younger Damon as 'I'. Each of the three journeys is given a title/theme: The Follower, The Lover, The Guardian. In each, he travels somewhere and meets someone (or travels with them), and it is these relationships that In a Strange Room is about (as well as being about travel itself). I felt that each section was more about the relationship and less about the travel than the previous one - in the final section, the travel seems almost incidental, a setting for the relationship more than anything else. In a Strange Room is a quiet little book - reflective, sparse, a little detached as the narration illustrates, and essentially introspective. The first two sections in particular are about things not said, not done, rather than dramatic actions or plotting. Scenery and setting is described, but this is not a travel brochure. I found In a Strange Room engrossing and touching, both in low-key sorts of ways, and am glad it made it to the shortlist, and that I got around to reading it. As I've said before, in some ways the winner of the Booker is a little irrelevant to me - my pleasure is in getting to know some new authors, and also sometimes seeing a favourite author get some more attention. Four of those six made the judges' shortlist, so I can't feel too antagonistic to them (even if the two they missed were probably my favourites, or at least in my top few).